What can a comic strip fan do for light summer beach reading? You're certainly not going to risk getting sand in your expensive reprint books, and reading a stack of old tearsheets out by the pool seems ill-advised. Nevin Martell offers the perfect solution in Looking for Calvin and Hobbes. Martell writes about pop music for magazines, and he's the author of some fluffy rock star bios, so this book is a bit of a departure for him. Seeing those credits I wondered what he could possibly bring to the table in a book about comic strips. The answer is that he brings very little in the way of comic strip expertise (no Nevin, Ignatz does not throw stones at Krazy Kat) but that turns out to be a good thing. If this had been 250 pages of navel-gazing analysis of the comic strip it would have been insufferable. Rather, Martell tells the story of his adventures trying to wheedle an interview out of the famously reclusive Watterson. It's a Don Quixote story that is humorous, well-written and (if I may borrow that tired summer-reading platitude ) a real page-turner. Martell skillfully interlaces the main narrative with bits of Watterson biography, musings about the comic strip, and interviews with Watterson's fellow cartoonists. In true summer-reading style, no subject sticks around long enough to become tiresome. 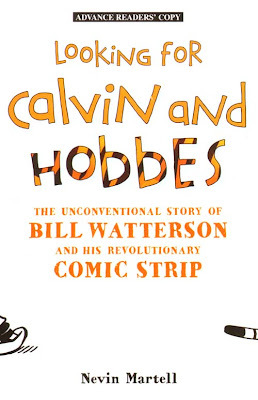 If you're looking for a 'serious' Watterson bio, a la Schulz and Peanuts, you're not going to get it -- thank goodness. But Martell does a fine job of picking up the crumbs of Watterson's public appearances and infrequent writings, doing a surprisingly thorough job of pulling Watterson out of that hermit crab shell of his. I have only a few criticisms of the book. When Martell discusses comic strip history he shows himself to be a rank minor leaguer. The author should have shown the book to someone with the chops in that department to squash embarrassing little mistakes like the aforementioned Krazy Kat clunker. The other criticism may not be valid (I read an advance copy of the book) but I wondered why we don't get a single illustration. I realize that the book could not reproduce any Calvin & Hobbes strips, but why no photo of Watterson, no example of his college or Cincinnati Post cartoons? Surely the publisher could have gotten permission to reproduce a few items that lay outside of Watterson's control freak zone of influence. Jonathan Barli's Digital Funnies image collections have been advertised on the web for quite a few years now, but it took me a long while to get on the bandwagon. I'm glad I finally did, though, because the first collection I tried, a complete set of images of the New York World's 1905 comics sections, is absolutely fabulous. What could be more pleasant for an old funnies lover than an afternoon clicking away on image after image of rare material by McManus, Kahles, Carr and Follett (a forgotten cartoonist, but one of my faves). Barli's source material is a beautiful run of tearsheets. I saw only a few minor chipped corners and brown center creases. The scans are only at screen resolution (72 dpi) but the images are nice and large so that you can zoom in to see even the finest details. Barli wisely didn't go overboard trying to tweak these images in Photoshop. It looks to me as if he probably upped the contrast and lightened just a tad, enough to take away that tan haze that scanners love to cast over old Sunday pages. My only criticism of the collection is that the image names are simply 001.jpg, 002.jpg, and so on. Though this does gives us the correct order in which to view the sections, Barli could have made the package a lot more user friendly by including the date of the sections in the file names, or even better, the date plus the titles of the strips on that page. Then I could easily navigate through the files to find all of the Panhandle Pete or Terrible Twins strips in one fell swoop. By the way, there's no image viewer application included with these collections. That's fine by me because that sort of thing often gets in the way of the user viewing the images in the app of their choice. However, if you are computer illiterate just be aware that you simply double-click on any file name and the image will automatically be displayed by your system's default viewer application. Hoo boy. Someone's going to have to explain to this clueless neophyte how you're supposed to deal with items like this. Steven Stwalley, a friend of Stripper's Guide, sent this item to me for a little blog-flogging. So I want to be positive, but my churlish need to be objective leads me down another path. So let's start with the positive -- this is one VERY cool format. I don't know how this group managed to find a printer who would tackle the job, but what we have here is a giant newspaper broadsheet 'comic section', filled with (mostly) full page comic strips. How cool is that? When it arrived my heart skipped a few beats -- I'm just not used to seeing any comics printed this large that aren't yellowed and musty. The idea is inspired. Offer a group of cartoonists the opportunity to draw a giant full page strip just like the fabled newspaper cartoonists of the good old days. The problem is that most of the creators represented here squandered what may be a once-in-a-lifetime chance to spread their wings, or are simply not up to the task. A few did rise to the bait, like Diane Nock who offers us a beautifully designed page that riffs on classic comic strip format and conventions. There is plenty of excellent cartooning in the book, but darn few pages that make any real use of the vast acreage of newsprint that they had to work with. Many, in fact, give the impression of being blown-up comic book pages. What was really disappointing, though, was the writing. Most of these strips reminded me of the kind of narcissistic claptrap that I remember from the lesser underground comics of the 1970s. You know, the stuff that cartoonists drew after downing a couple hits of acid with a chaser of Wild Turkey. I'm sure the creators (then and now) think they're producing amazing avant-garde works of art, but I have no patience with such self-absorbed gobbledegook. That's not to say I can't appreciate artsy comics. I'm not a troglodyte in these matters -- I read all 300 issues of Cerebus and most everything Robert Crumb and Art Spiegelman have ever produced -- but most of this material is art for art's sake, and not in a good way. I do hope that the Cartoonist Conspiracy will try this experiment again. Perhaps after seeing the first issue, these cartoonists and others will better understand the potential inherent in this classic format and rise to the occasion. Allan, I'm sure you're aware of the "Wednesday" broadsheet publication that DC Comics has been publishing for the last three months. 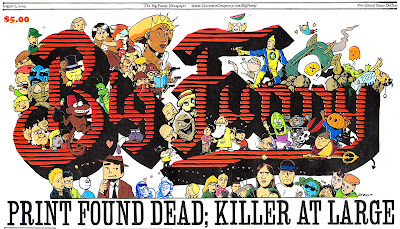 As with "Big Funny," there seems to be the tendency to either not understand the potential of the larger format, or the artists treat it simply as a large comic book page. The "Wonder Woman" feature even seems to be trying to fit five or six comic book pages onto one sheet, which I find just unreadable. "Kamandi" (done in a gorgeous "Prince Valiant" style) and "Strange Adventures" (which reminds me of both the early "Buck Rogers" Sunday pages and the European "Valerian" series) are, to me, the standouts in that effort. Thanks for the review, Allan! I too hope we get around to another issue of BIG FUNNY someday. I, of course, like all the comics in the publication... but I totally agree with your criticism that a lot of the cartoonists did not take advantage of the unique format. Hopefully this will be less the case if we do it again. I was hoping to get more submissions from poster and print artists (which we have a lot of in Minneapolis), who are naturally thinking more about the design of a page as a piece of free standing art. I'm going to pursue this more aggressively if we do it again. Lonny Unitus and Jenny Schmid both have this background, and have two of the best designed pages in the publication, I think. I saw a sample of that DC publication online but didn't realize it was broadsheet -- just assumed it was tabloid. It's a comic book store item, right, not a newspaper insert? Thanks for taking a less than positive review with good grace. I hope to do a rave on issue #2! No, the DC Comics pub is not a newspaper insert, but it HAS been a weekly 12-page stand alone broadsheet publication on good ol' newsprint. The series ends next week, I believe. I hope this has been popular enough for them to continue in some form. The first week of the Superman feature was printed in USA Today and now they are posting each new week's strip online. Flushed with success over Hopalong Cassidy's newspaper fling following TV and radio build-up, Los Angeles Mirror Enterprises Syndicate will do more of the same. 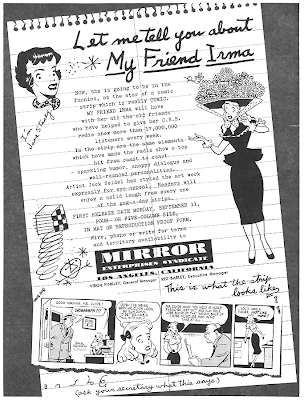 This time it's "My Friend Irma" (Marie Wilson on CBS and in movies) who will be the subject of a comic strip. 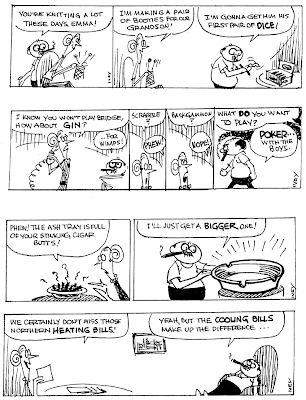 The gag-a-day, without continuity, and due Sept. 11, is drawn by 33-year-old Jack Seidel, who sold his first cartoon at 18 and has been coached by Merrill ("Freckles and His Friends") Blosser, Ed ("Mark Trail") Dodd, Jimmy ("They'll Do It Every Time") Hatlo and others. The contract was with Columbia Broadcasting, which owns character rights. Cy Howard created and directs the radio program. I recall this strip, it ran in the old ST.LOUIS STAR-TIMES. It was just part of a MY FRIEND IRMA machine. The radio series also led to Comic Books, a couple of movies, one being the Martiin & Lewis debut, and the first series aired live from CBS's then- new "Television City" studios in Los Angeles. Despite the avowed influences, to my eye the artwork is an obvious and awkward knock-off of Al Capp's style (with "Priscilla's" weird hand poses thrown in). This is the first installment of a new series I'll do as opportunities appear. Yesterday I received an email from an ardent Ernie Bushmiller fan. He was having conniptions because he couldn't find any examples of the strip Norman by his favorite cartoonist. Why did he think such a strip existed? Only because several websites refer to it. Lambiek: "In 1971, Bushmiller produced a shortlived feature called 'Norman'." AllExperts: "He [Bushmiller] also created a very short-lived strip named Norman, which was syndicated in 1971." Oddball Comics: "In 1971, Bushmiller created another strip, but unlike NANCY, the new strip, NORMAN was short-lived." Dave Strickler is not to blame here. He makes no claim that all the features he lists are real ones. His work is just a transcription of what was reported in E&P. The problem is with people who apparently have never heard of the saying "take it with a grain of salt", the imprudence of blindly trusting secondary sources. With no corroborating information, they could have said "it has been reported that Bushmiller did a strip called Norman in 1971". But no, instead they report it as a fact with no caveats. I discover misinformation like this all too often on the web. After the first website comes up with one of these whoppers, the misinformation immediately starts working its way onto other sites like a virus. Soon there are so many websites parroting the same BS that readers, like our Bushmiller fan, quite reasonably assume it MUST be true. Hey kids! Know of a phantom feature you'd like to see busted on Stripper's Guide? Drop me a line! At least NORMAN is like NANCY in one respect: it doesn't make much sense. Mind explaining this "gag" for me? Eli Bauer was an animation writer, working in east coast at Terrytoons and on some of the "Tom and Jerry" cartoons directed by Gene Deitch. 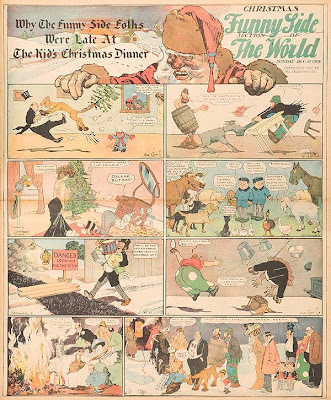 To give another comic strip connection, he also wrote on the animated "Krazy Kat" which aired in 1963. First things first: as you can see in the credits above, I'm not a completely impartial reviewer when it comes to this book. 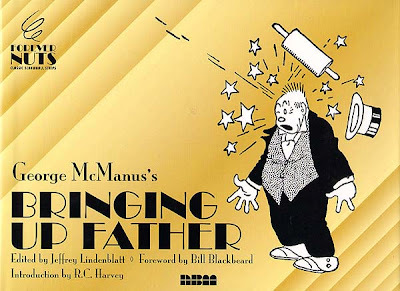 Bringing Up Father is probably my favorite comic strip of all time, so when NBM decided to reprint the first two years of the strip I was delighted to be a part of it. There was, as most of you know, a prior reprint effort of some of this material. In the 1970s, as part of their Classic American Comic Strips series, Hyperion did a Bringing Up Father book that covered some of this same ground. But there were three problems with it; the reproduction in the book was just awful (the material was printed just as it came off the old dilapidated tearsheets, warts and all), the strips were printed so small that McManus' chicken-scratchy sloppy lettering was sometimes illegible, and quite a few strips were missing and others misplaced in the strip's continuity. The first problem was solved in this book with the application of over 300 hours of restoration work by yours truly. Some reviewers have commented that some amazing pristine source must have been found to get the strips looking so great. That's a comment I cherish because it speaks well of my work, but the assumption is incorrect. All but about a half-dozen of the strips reprinted are from browned, flaky, often badly-printed and misprinted newspaper tearsheets. The remaining few were -- ugh -- from microfilm, a REALLY big challenge of restoration. The size problem was improved by printing the strips about 15% larger than in the Hyperion book. While I would have liked larger, it's amazing what an improvement this small increase has made. The strips are all quite legible now (in part because I restored the lettering as well as the art). The problem of missing and out of sequence strips was solved by using Bringing Up Father's home paper, the New York American, as our benchmark. Hyperion worked off of Bill Blackbeard's collection, which was a mix-up of San Francisco and other papers. That led to pretty major omissions and continuity mix-ups. The strips in the new book are all in sequence, not a single one missing, and each is dated based on its original appearance in its home paper. Besides doing the restorations, NBM allowed me to do something that I think should be a standard feature in all classic strip reprint books. I wrote annotations for many of the strip episodes explaining the references which are likely to be opaque to today's readers. And it's not dry history lessons -- I talk about such things as pop songs of the day, the curious origin of collapsible tophats, the allure of French postcards, and so on. The idea is to bring these strips and their very dated cultural references back to life for the modern reader, and if the reviews I've read are any indication it has worked quite well. By the way, I wrote so many annotations that NBM couldn't fit them all into the book! You'll find a link to an expanded version of the annotations on NBM's website. The good news is that my annotations were cut back so that the book had room to print the BUF strips all the way to the end of 1914 (Hyperion's stops in July 1914) so you get in total over 100 strips never before reprinted. Of course the real question is whether the strip is entertaining. While we all enjoy McManus' work in the 'classic' period of the 1930s and 40s, his work in 1913-14 is rougher around the edges. His amazing clean lines are already there, though, and his humor is fully developed (after all, he was already a veteran stripper at this point). What I find particularly interesting is the contrast between the 1913-14 Jiggs personality and its later counterpart. The 1940s Jiggs, despite his protests to the contrary, is a subdued, domesticated homebody. The early Jiggs is a rough-and-tumble troglodyte, a gambler, a womanizer, a fighter, either drunk or trying his best to get to that state. In short, he's a more entertaining character in his raw state than once Maggie had a score or so years to wear him down. By the 1940s Jiggs had grown into a bit of a sarcastic old sourpuss, while in 1913 he is unadulterated, full of life and revelling in his own crudity. I re-read the BUF strips of 1939-40 shortly after working on this book. I can honestly say that if it were not for the transcendent art of the later strip I'd choose the material of the 1910s over the later stuff hands-down. You can order your copy at NBM's website or at Amazon. Apologies for not knowing about your restoration efforts before this, Allan. Mind if I ask what techniques you use in working on material like this? Scanner/Photoshop or working on cleaned-up prints of the strips with pen & ink? I'm a Photoshop man. No copiers, light boards and magnifying glasses for me. myself, but only of the most basic patterns. Well, that was an experience. Most of the links were bad, others in Japanese, other offering only screen resolution material. Finally found LetraSet, though, which had actual physical tone sheets -- who'd have thunk they still existed -- cool! I can scan them in at 1200 dpi and have a full complement of tone levels! Picked out a liberal selection (you can't really tell what the heck you're buying since the pictures are useless) only to find that their website is so flaky you can't successfully place an order. Sigh. Well, it's not a big deal. After doing the restoration work for two books I find my vision has been really hurt by the experience. Now I'm wearing reading glasses for all reading, not just low light conditions as previously. Thinking I may not want to do any more of these huge projects. I'm currently scanning and restoring parts of my collection of old dailies. It would be interesting to get a step-by-step of how you scan/restore to get so good results. Sorry, there just aren't many shortcuts. I do have a few very minor tricks I've learned over the years but in broad outline we work the same way. If you want that Fung material to REALLY pop, though, you may want to try redoing the zipatone. What a difference that makes -- but it's also very time-consuming. Looking at the sample above, I'm hoping you left the titles on the earliest strips, since these changed from day to day for many months into the feature. Though it suddenly occurs to me that you may have left out the ones that weren't technically 'Bringing up Father'. I was prepared to lobby for putting titles on the strips until I realized that we would have to print the strips smaller because of that. I for one was willing to forgo that in the cause of printing the strips as large as possible (given the limitations of book size which were not negotiable). I would have been happy to put the titles in my annotations, but of my tearsheets and the ones we got from other sources, VERY few had the titles. I didn't look at the NY American myself so I can't say for sure, but I think BUF seldom had the 'subtitles' we associate with this early material. ...and we printed *ALL* the strips that were in the BUF series, titled or not. Wonderful work, and that includes the annotations. They become more necessary with every passing year. The Li'l Abner Sunday reprints a few years back had some nice annotations. This kind of attention provides the reader a rich experience in revealing contours of the strip enjoyed by its readers when first produced that would have otherwise been lost. Well done. Got my copy of BUF today.... fantastic... I admit, I loved the strip for the GM art, he was amazing, but these early strips (a lot like seeing the first Dennis the Menace cartoons)are so raw and the language is like reading modern day Chaucer, but funnier. Hopefully there will be reprints of the 40's art someday. I used to go to my collge library just to look at the scans. Love this stuff! It was great seeing Jim again yesterday!